Size of this preview: 332 × 598 pixels. Other resolutions: 133 × 240 pixels | 1,454 × 2,621 pixels. Figure 3. 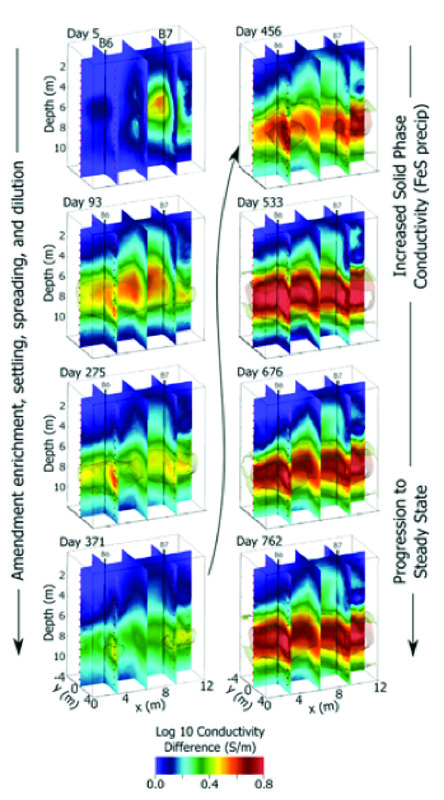 Example 3D time-lapse ERT images showing bioamendment emplacement and movement, seen as increased bulk electrical conductivity (first column), followed by later increase in bulk conductivity arising from FeS precipitation resulting from microbial activity (second column) (after Johnson et al., 2015b) (from ESTCP project ER-200717). This page was last edited on 31 January 2017, at 19:17.